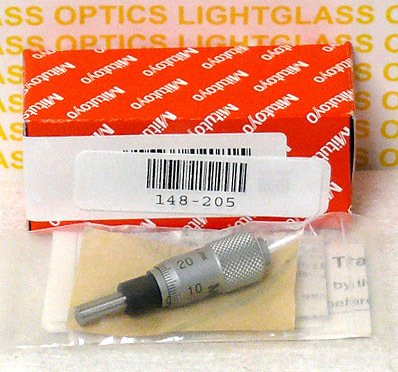 The Thorlabs 148-205 Micrometer Head is made by Mitutoyo for Thorlabs, and has a 1/4" travel (6.5mm). The mounts in a .250" hole. It has a spherical tip, which offers a superior single-point contact for optics applications. This fits in many of Thorlabs mounts, so if you want to upgrade your mounts to micrometer actuators, here is your chance to do so at a reasonable price! New in the package.